Storytelling is just for kids? NO! History is dull? NEVER! Professional Development is boring? Not if it’s by Darci Tucker of American Lives: History Brought to Life™! Whether you need a storyteller for your festival, an assembly for your students, a consultant for your museum or professional development for your staff, Darci has what you need. Darci founded American Lives™ in 2000, to bring history to life for students and museum visitors; to help them understand our culture, rights and responsibilities as Americans by exploring the lives of our predecessors. Darci started with Revolutionary Women™, her original one-woman play about the American Revolution. Her company now offers a wide variety of historical programs, plus professional development, consulting and traditional storytelling. American Lives™ features both Darci Tucker and her husband Terry Yemm. 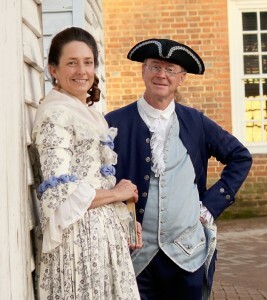 They are veteran museum educators with more than 50 years of combined experience teaching history at Colonial Williamsburg, the nation’s premier living history museum. Darci holds a BA in Political Science from UCLA. She is a playwright, actress and storyteller who performs her original, one-woman play, Revolutionary Women™, in schools across the nation. She literally wrote the book on how to portray people from history. She trains teachers and museum professionals to use storytelling and character interpretation as teaching tools, and writes history and literacy lesson plans. She tells stories at festivals across the country, created a character interpretation program at a TN university, and consults for museums and municipalities who want to improve their visitors’ experiences. Terry is a garden historian and actor who graduated from the University of South Alabama. He specializes in early American southern landscapes; plant materials, garden design and horticultural techniques. He consults on historic landscape restorations and provides gardening programs in 18th century character.